Wing span: 1 1/4 - 1 7/8 inches (3.2 - 4.7 cm). Identification: Upperside is dark brown; clear spots on forewing are small, triangular, and not aligned. Male forewing has a costal fold enclosing scent scales. 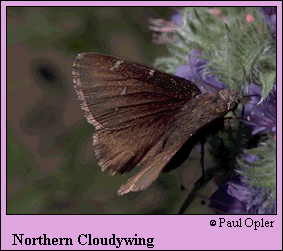 Underside is brown with gray overscaling; hindwing has 2 dark bands. Life history: Males perch on or near the ground in forest openings to wait for females. Eggs are laid singly under leaves of the host plants. Caterpillars feed on leaves and live in shelters of rolled or tied leaves. Fully-grown caterpillars hibernate. Flight: One brood from May-July in the north, earlier in the south. Two broods from March-September in Texas. Caterpillar hosts: Various plants in the pea family (Fabaceae) including beggar's ticks (Desmodium), bush clover (Lespedeza), clover (Trifolium), lotus (Hosackia), and others. Adult food: Usually nectar from blue, purple, pink, or white flowers including dogbane, selfheal, crown vetch, Japanese honeysuckle, thistles, common milkweed, Deptford pink, hoary vervain, and others. Habitat: Open or scrubby boreal woodland and forest edges. Range: Nova Scotia west across southern Canada to British Columbia, south through California and the Rocky Mountain states to Mexico, Texas, the Gulf states, and Florida.